Dr. Geo Espinosa, ND, LAc, IFMCP, CNS, clinical assistant professor of integrative and functional urology at New York University and author of Thrive—Don’t Survive: Dr. Geo’s Guide to Living Your Best Life Before & After Prostate Cancer, explains how prostatitis is diagnosed—and how it is often misdiagnosed. 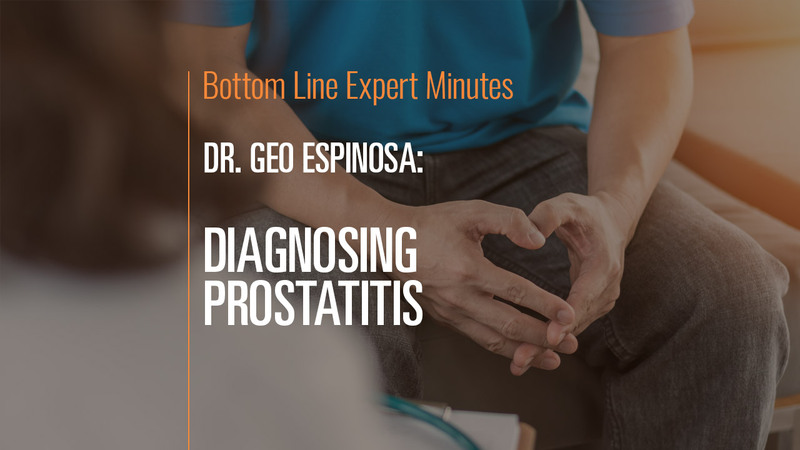 A diagnosis of prostatitis is based on a man’s symptoms, typically pelvic or scrotal pain and urinary difficulties, including increased frequency and urgency. Other conditions that mimic prostatitis include overactive bladder and normal enlargement of the prostate gland with age. The NIH Chronic Prostatitis Support Index Score can help doctors determine whether they are dealing with prostatitis or another condition. Other symptoms associated with prostatitis include lower back pain, sexual dysfunction, migraines, irritable bowel syndrome (IBS) and chronic stress.